For its eighth year running, Darwin Day returns to Minot State University Feb. 11-12. Darwin Day is a global celebration of science and reason, focusing on how all living creatures evolve. MSU’s Darwin Day celebration begins Feb. 11 with a presentation by Charles Derby, professor of neuroscience at Georgia State University, “Yuk! Yum! Yikes! And Huh? Mechanisms of chemical defense in avoiding predators by inking molluscs,” in Cyril Moore Science Center Auditorium, 7 p.m.
Feb. 12 from 8:30 a.m. to noon, there will be a variety of biology activities about evolution in Cyril Moore Science Center. As well, individuals may tour the greenhouse and research labs. On the greenhouse tours, they can learn about biology. On the lab tours, they can learn about research in cancer, addiction, herpetology, geology and plant physiology. 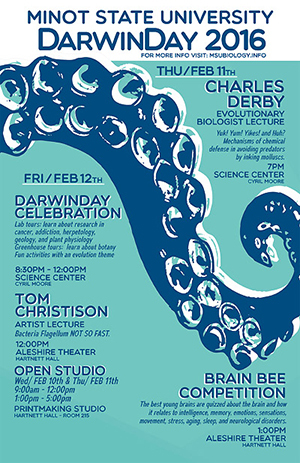 At noon in Aleshire Theater, guest artist Tom Christison will present “Bacteria Flagellum Not So Fast.” The Darwin Day celebration will conclude with a Brain Bee competition in Aleshire Theater at 1 p.m. This competition for high school students, grades 9-12, challenges students with questions about the brain, in a format similar to a spelling bee. For more information on the Brain Bee competition, visit http://www.internationalbrainbee.com/. All events are free and open to the public. For more information on the schedule of events for Darwin Day 2016, please visit http://msubiology.info/. Carlen Gilseth, assistant professor of communication arts, will discuss the epic theater of German dramatist Bertolt Brecht Tuesday (Feb. 9) in a Northwest Art Center lecture. Gilseth’s presentation will begin at 7 p.m. in Aleshire Theater. Gilseth will direct performances of Brecht’s “The Chalk Circle” April 19-22 and will explain how he plans to use the new evidence about Brecht in staging the university production. The Mohall native is in his fourth year of teaching communication arts and theatre at MSU. He holds a bachelor’s degree in fine arts and business from University of Jamestown and a Master of Fine Arts in directing from the University of Texas at Austin. From 1995 to 2011, Gilseth held several leadership positions in the Texas Thespian organization, and in 2012, was inducted into the Texas Thespian Hall of Fame. In addition, he served on the Texas Educational Theatre Association board of directors and chaired its 2004 convention. Many of his former students are currently on Broadway, in regional theaters, national tours and in film and television. As a 2001 Fulbright Memorial Fund Scholarship recipient, Gilseth studied traditional Japanese theater arts in Japan. A question-and-answer session and informal reception will follow the program. The lecture is free and open to the public. This project is supported in part by a grant from the North Dakota Council on the Arts, which receives funding from the state legislature and the National Endowment for the Arts. For questions, contact Avis Veikley, Northwest Art Center director, at avis.veikley@minotstateu.edu. Auditions for Minot State University’s Summer Theatre’s season 51 will be held in Aleshire Theater Feb. 12 from 5 to 7 p.m. and Feb. 13 from 2 to 4 p.m. The four possible productions for season 51 include “Clue: The Musical,” “Middle of Nowhere,” “Mid-Life Crisis the Musical,” “Schoolhouse Rock,” “Noises Off” and “Pippin.” In addition to cold readings, actors should come prepared with 32 bars from any Broadway show tune and a one-minute comic monologue. Actors are advised to come dressed for movement during their audition. Audition DVDs are accepted and must showcase vocal, acting and movement capabilities. The deadline for DVD submissions is Feb. 12. Cast lists will be posted Feb. 27. Rehearsals for productions begin May 21. The MSU Amphitheater, set in the grass-lined hillside north of the campus, is home to Summer Theatre. For questions, contact Carlen Gilseth, theatre director and communication arts assistant professor, at 858-3178 or carlen.gilseth@minotstateu.edu. To fight winter doldrums, the Minot State University Art Program is offering clay open-studio sessions to the public during spring semester. The price, assessed per session, is $20 for adults, $10 for MSU students and $5 for children. An adult must accompany children. Again, the proceeds from the open studio directly fund scholarships for ceramics students; this semester, proceeds will finance scholarships for students on the Ceramics in China study tour. Faculty work with participants depending on their needs to learn and grow in clay. Please RSVP linda.a.olson@minotstateu.edu indicating interest, so that instructors can prepare and arrange for additional helpers if needed, but walk-ins are welcome. Tuesday (Feb. 9) — Use of basic hand-building techniques for those who want to create in clay, but have little or no experience. Basic hand-building techniques of pinch, coil and slab and equipment, such as the slab roller and coil extruder, will be demonstrated. Feb. 11 — Continuation of basic hand-building techniques with assistance with creating pinch, coil and slab and using the slab roller and coil extruder. Feb. 16 — Demonstration of basic throwing techniques of wedging, throwing; session for those with some clay experience, but little throwing experience. Feb 18 — Continuation of basic throwing techniques with focus on trimming; assistance with throwing and trimming pots. March 1 — Utilization of slip-casting techniques. March 3 — Continuation of basic slip-casting techniques and assistance with slip-casting. March 8 — First session of Family Week, where families create together. March 10 — Family Week continues. March 22 — Use of glazing techniques with a demonstration with glazing pottery and assistance with glazing pottery. This session is free to those who registered for two of the above sessions. March 24 — Session free to those who registered for two of the above sessions. March 29 and 31 — Open session for those who registered for the above sessions. March 31 — Potluck sharing session in the studio. To access the studio, individual should enter Pioneer Hall by the back door. For questions, contact Olson at linda.a.olson@minotstateu.edu. Minot State University is offering the most scholarships ever for the upcoming 2016-17 academic year. New, transfer and returning students are encouraged to apply soon, as applications will be accepted through Feb. 16. Scholarship application forms are available at http://www.minotstateu.edu/finaid/scholarships.shtml. "We encourage all prospective and returning students to submit the 2016-17 MSU Scholarship and Award Program Application to be considered for the wide variety of scholarship options available at MSU and submit the 2016-17 Free Application for Federal Student Aid (FAFSA) by April 1 to be considered for the best possible state and federal student aid options," said Laurie Weber, financial aid director. Numerous scholarships are awarded based on academic achievement, extracurricular activities, community involvement, leadership, and service and legacy. New freshmen and transfer students can apply for the Great Plains Exceptional Scholar Award, which offers full tuition for four consecutive years to students meeting the scholarship requirements. It can have a value of more than $20,000 over years. Other scholarships offered to new freshmen and transfer students include the Distinctive & Engaged Scholarship and Service for Common Good Scholarship Awards, which offer awards up to $3,500, as well as the Transfer Student Scholarship Award for up to $1,500. Students, who previously received an MSU Alumni Association Scholarship and are junior, senior or graduate students, can also apply for the Peggy Wittliff Memorial Scholarship. This $4,000 scholarship is paid over the full academic year, and is available at http://www.minotstateu.edu/alumni/scholarship.shtml. Additional scholarships for children of MSU alumni can also be found there. For questions about alumni scholarships, contact Janna McKechnie, director of alumni relations and annual giving, at janna.mckechnie@minotstateu.edu or 858-3234. For other scholarship inquiries, contact the Office of Financial Aid at 858-3375 or financialaid@minotstateu.edu. Students should also check with their academic departments for additional scholarship opportunities. Minot State University welcomes new employees, Joe Dale III, Breann Hieb, Shane LaDage, Nicholas Nissen, MariDon Sorum and Brent Winiger. Dale, an assistant football coach-defensive backs, was previously a graduate assistant at the University of Utah, Salt Lake City. Originally from Irving, Texas, Dale completed a bachelor’s degree in sports management/parks and recreation at the University of Utah, where he is pursuing a master’s degree in educational psychology. He and his wife, Kaylee, have six children. Hieb is an office assistant in the Office of Facilities Management. LaDage, an assistant football coach-wide receivers, previously coached at the University of Wyoming, Laramie. He earned a Bachelor of Science in exercise science in 2011 and a Master of Education in sports leadership in 2013 from Southwest Minnesota State University. Nissen, an assistant football coach-offensive line, previously coached at Southern Utah University, Cedar City. He earned a bachelor’s degree in physical education and exercise science in 2014 from SUU, and he is working toward a master’s degree in sports conditioning and performance from there. Sorum, adjunct special education instructor, is also certified as an interpreter for the deaf. Before joining MSU, the Minnewaukan native worked as an aging services coordinator with the North Central Human Service Center, Minot. She completed a bachelor’s degree in social work at Concordia College, Moorhead, Minn.
Winiger, vice president for administration and finance, previously served in the same capacity at Rivier University in Nashua, N.H. Prior to RU, he was the vice president for financial affairs at the University of Mary from 2005 to 2012. He holds a bachelor’s degree in accounting and an MBA from Boise State University. For hobbies, Winiger enjoys playing guitar and exercising. He and his wife, Shelley, have been married 33 years, and they have two adult children. Feb. 3-19 — “Americas 2016: Paperworks,” a national juried exhibition with guest juror Karen Kunc of Lincoln, Neb., Hartnett Gallery. Feb. 3-March 1 — “Americas 2015: Paperworks” Best of Show, prints by Mark Sisson of Stillwater, Okla., Library Gallery. Minot State University’s Nursing Student Association recently participated in the statewide convention. Four MSU nursing students were elected to the state board to serve the 2016-2017 term. They are Victoria Holman, second vice president; Laura Hellmuth, director of breakthrough to nursing; Sylvia Wages, director of legislative education; and Alexandra Hemingson, secretary. Thirteen students attended the three-day event. This is the most representation MSU has had on the state board in years. Steve Peterson, research associate for the North Dakota Center for Persons with Disabilities, was recently elected to the Verendrye Electric Trust Board. This five-member board governs Operation Round Up. Since 1996, Verendrye Electric Cooperative members have voluntarily rounded up their monthly electric bills to the nearest dollar to benefit community organizations and people with extraordinary medical expenses. The program grants approximately $50,000 a year and has given more than 900 grants, totaling more than $860,000.